Our 100% online Personal Protective Equipment (PPE) Program and Selection Training course introduces employees to PPE programs and selection of the proper Personal Protective Equipment. This course would be applicable to workers who wear PPE on the job. Our Personal Protective Equipment Program and Selection – PPE Training course should be taken by workers who wear PPE on the job. This course is designed to introduce employees to Personal Protective Equipment programs, and the proper selection of Personal Protective Equipment. This course should be used as a training tool within a comprehensive Personal Protective Equipment (PPE) program designed for employees. The employer shall verify that each affected employee has received and understood the required training through a written certification that contains the name of each employee trained, the date(s) of training, and that identifies the subject of the certification. Presented through our state-of-the-art Online Training System (OTS), this course includes up-to-date, high quality training designed with your learning as our top priority. The course features interactive training, which combines audio and visual elements for maximum retention. The course is completed entirely online using a computer with an internet connection and is available 24/7. For your convenience, it can be completed over time, and your progress will be saved to the last section completed. We are so certain you will be satisfied with your experience, that we offer a 100% Money Back Guarantee*. 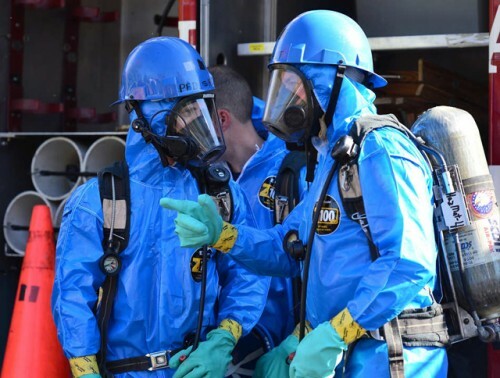 The need for PPE | Contents of a PPE Program | Determining PPE needs in your workplace | PPE Selection | Maintenance and replacement | Training employees | Employer and employee responsibilities. The objective of this PPE training course is to introduce employees to Personal Protective Equipment programs, and the proper selection of Personal Protective Equipment. This Personal Protective Equipment training course consists of the below 2 sections, which students complete through our Online Training System (OTS). This course should be used as a training tool within a comprehensive Personal Protective Equipment (PPE) program designed for employees. Once the course is completed, you will immediately be able to download, save or print your PPE Certificate of Course Completion which is provided in PDF format. For more information on this topic, see OSHA’s Personal Protective Equipment page. The page provides a personal protective equipment definition, reviews proper use and selection of PPE, lists the OSHA PPE Standards, and provides various links to published resources. Please note that this course provides valuable Personal Protective Equipment training and PPE selection training, but is not meant to replace company-specific training provided by your employer on equipment use and procedures for your particular work environment. Company specific training, including hands-on training, with the actual PPE that workers will use is very important. You must be trained by your employer on the hazards, equipment, engineering and administrative controls, safe work practices and emergency plans specific to your role and workplace.